Grab your business cards, a writing implement and your are ready! In B´Cards you will learn my favorite Mentalism using business cards. This is the ultimate and most complete publication in this topic. Openers, mindreading, prediction systems, emotional routines and more! Business Opener: A perfect and direct way to open a close up set, predicting a participant´s choice and give your card as souvenir. Pareidolia: Wonderful simple, entertaining and credible method to force thoughts. ABCAAN: Give your participant the opportunity to feel his intuition and psychic abilities. 3 Moments in Time: Predict the Past, Present and Future of any three members of your audience. Ungimmicked in the hands approach to "Triple Prediction/Mental Epic"
Picasso Peek: Full peek of a business card for your toolkit. Double Perception: A system to force dichotomic choices (YES/NO, SUGAR/SALT, HEADS/TAILS, etc) with complete control. E`Wave: Small packet effect using just 4 business cards, an interesting theme and a final precognitive souvenir that you participant will keep. Positively Negative: My version of the classic "Positive/Negative". Only one card, no ambiguous message. Anywhere Dermovisionist: A bold method to read thoughts anytime, anywhere just with two business cards. No folds, no rips, no switches, complete peek. Impromptu Peek Device: Even when the participant isolates his thought between two unprepared business cards, you are able to read his mind with 100% accuracy. BMOABT: Just your business cards will allow you to create an amazing mindreading effect using an "invisible book"
Emotional Truth: A group of participants is invited to an emotional re-connection experience, which ends in a surprising and mysterious moment. Life and Death: Two options, one experience of intuition and mindreading. Animal Intuition: Predict your participant´s own "Personal Animal" in a fun manner. In here you will learn a new psychological technique to predict thoughts without gimmicks, anytime, anywhere. Pablo has put together an assortment of various routines, presentations and subtleties using nothing more than a stack of business cards. Many of the routines are completely impromptu. There are ideas that you can easily always have on hand or can create on the spot with just a pen and your business cards or blank cards. There is something for everyone in this collection. I’m sure some of the presentations and routines will spark other ideas. 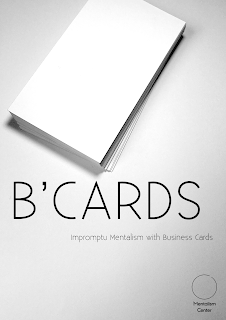 B'Cards is a fantastic collection of mentalism routines with business crds that you can use in any kind of performance situations. Some of them are really good to use in a corporate performances and to impress your clients. Very well done Pablo!